For many anglers once the calendar hits May, one thing is on their mind when they are in search of catching bass and that is vegetation, specifically the new lily pads that grow in many lakes and rivers. There are several reasons that lily pads play such a key role in bass habitat, the first is that they provide bass with cover, both from the sunlight shining into the water, and also it provides them with an ambush point to feed, which leads into my second point. The amount of activity that takes place around lily pads is great, small insects will land on to these floating green circles and in turn bring in bluegills, sunfish, etc., all of which are mighty tasty to a big ‘ole bass! The next time you pull up to a stretch of lily pads, be sure to listen for bluegills popping away underneath the pads. I also feel that lily pads hold quality bass more often than not, because of the water quality and bottom composition where they are growing. A good portion of the time lily pads grow in nice clean, bottom areas that have some current flow, this keeps the water oxygenated and the food supply keeps getting replenished. Lily pad fields can develop in many places on your favorite lake or river. Pads can also develop in numerous backwater lakes and sloughs on rivers. On lakes, pads will start to pop up in shallow bays and shallow flats, the depth of water that lily pads grow in ranges, but I like to look for areas that have deeper water nearby. I use a two-prong approach to look and identify these key characteristics. First, I like to idle by the areas I want to fish and use the Side Imaging on Humminbird Helix 10 unit to look for any unique characteristics that show up on my screen. I then move my cursor and save those spots in my GPS. Once I have a list of spots I want to fish in the lily pads, I’ll move along the pad line by staying on my Minn Kota Fortrex trolling motor and moving at a speed that is slow and quiet enough to fish, but yet still cover water effectively. Then once I find that mother lode of bass grouped up in a small section of lily pads, I’ll deploy my dual Minn Kota Talon’s so I can focus on fishing and not move into or away from the targeted cover. One important item that I use on my Fortrex is a T-H Marine G-Force ELIMINATOR Trolling Motor Prop Nut. By replacing your standard trolling motor prop nut with this, you’ll decrease the amount of vibration and prop noise, both of which can wreak havoc in the shallows. The built-in cooling ports will also reduce the operating temperature, in turn providing longer battery and trolling motor life. My lure selection is based off of fishing the two different areas of the pads, the area that is in the midst of the pad field and then the edge of pads. 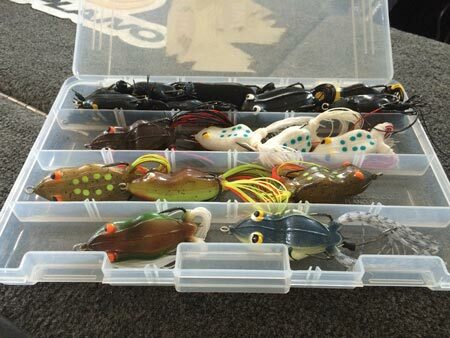 When I am fishing the area in the pads, my favorite lure for this is a Snag Proof Ish’s Phat Frog or Bobby’s Perfect Frog. 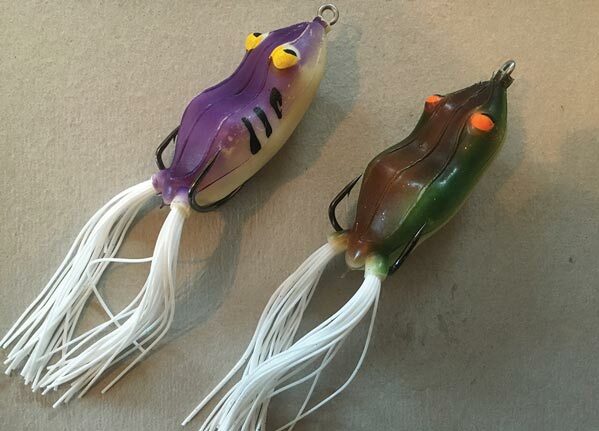 With either of these frogs, I can target the bass in the heavy cover and then work it across the pads and let it sit still when it comes to an open water pocket. I also like to walk-the-dog with my frog across open water as bass will come out of the lily pads and hit the frog in that open water. Since I like to work my frog with a lot of action and making casts in heavy cover, I use a 7’2” Wright & McGill Micro Honeycomb Series Rod as it has plenty of backbone, but still a soft tip so I can have a lot of action in my frog. I pair this rod with a Wright & McGill Victory Pro Carbon baitcast reel in the high speed retrieve so I can quickly reel in line as a bass makes a run towards the boat and spool it with 65 lb. Seaguar Smackdown braided line. Lures that I throw both on the edge and in the pads are a swimming jig and flipping a Texas-rigged soft plastic creature bait. The swim jig is nice because it can be fished on top up the pads and then dropped off the edge; I prefer a ¼ oz. jig in a bluegill pattern for this. A wide variety of tail colors can be used and, in my opinion, one needs to experiment with tail colors until the bass tell you what they want. Some of my favorites are white, pearl blue, salt and pepper and chartreuse. When I am flipping a Texas-rigged soft plastic creature bait, I am putting this bait right along the edge or placing it in the open water pockets between the pads. I’ll use a soft plastic bait that doesn’t have many appendages, as this will keep the bait from getting hung up on the vegetation, baits such as the Zoom Bait Super Hog, Z-Craw and Super Speed Craw are some of my favorites. When it comes to color selection, I like a black/blue or green pumpkin base and then, depending on the water clarity, use a green pumpkin with a colored flake in it. I prefer to use a 3/8 to ¾ oz. Eagle Claw Lazer Sharp tungsten weight, so I can make nice long pitches. Also, a tungsten weight is smaller than a lead weight. To get a solid hook up on these bass when I’m flipping around pads, I like to use 20 lb. Seaguar Flippin’ fluorocarbon as it has incredible knot strength and is in best-in-class when it comes to impact strength. I’ll rig my soft plastic on a 4/0 Lazer TroKar TK130 flipping hook, as it will stick that bass every time and the TroKar barb keeps my bait securely in place. 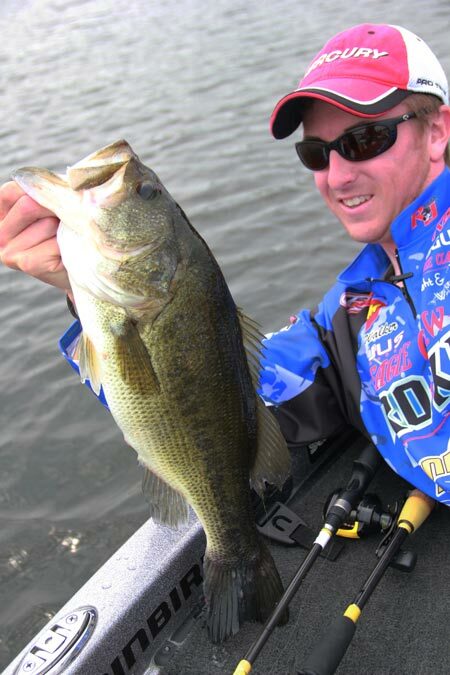 A great and exciting way to fish the edge of the pads is with a topwater lure, like a buzzbait. You can cast this lure parallel to the cover, or into the open water pockets and then retrieve it to the boat and with a buzzbait it is easy to keep out of the vegetation by speeding up your retrieve, many times this will invoke a reactionary strike from the bass. I like to use the new War Eagle Buzz Toad; this buzzbait comes with a Zoom Bait Horney Toad rigged on a dual plastic keeper system. Between the water displacement and noise of the buzzbait blade and the kicking action of the Horney Toad’s feet, it will call bass in from distances for a meal. The amount of success you’ll have fishing lily pads, will depend on several things, how quickly you can locate the key areas, and two, getting the bass out of that thick cover. So, always be reading and watching the water for clues as to what the bass are doing and how they are positioning themselves in the cover. Secondly, use the right gear. It will make your day on the water much more enjoyable! Glenn has been fishing tournaments for over ten years, spreading his passion and knowledge of the sport via articles and videos. He keeps busy fishing events across the Midwest and on the Mississippi River. Glenn’s sponsors include: Bass Boat Technologies, Ducky Products, Humminbird, Jeff Belzer Chevy, Mercury Marine, Minn Kota, Plano, Rayjus, Seaguar, Simms, Snag Proof, T-H Marine, The Rod Glove, TroKar, War Eagle Custom Lures, Wright & McGill and Zoom Baits. For more information check out glennwalkerfishing.com or on Facebook at facebook.com/glennwalkerfishing.